While my main aim for weaving this year is to try new structures, I have a secondary aim in mind. It has come out of a collision between my fibre allergies and interest in ethical textiles. I’d like to weave fabric in order to make garments from non-wool, ethical fibres. Why non-wool? It seems like I’m growing more sensitive to it. This really annoys me, as I love wool*. It’s easy to spin, scores well on ethical issues when it’s processed locally and is wonderfully warm. I’ve managed to wear so far it by donning thick, high-necked long-sleeve cotton tops beneath. Fortunately my hands and feet are free from irritation. I think I’d cry if I had to throw away all my hand knit socks. Why ethical fibres? Last autumn I set out to buy cotton substitutes to wool jumpers and my shock at how hard it was to find anything that wasn’t acrylic propelled me into reading up on ethical textile issues. Since then I’ve aimed to make most of my clothing purchases ethical and to avoid buying new clothes as much as possible, which has been surprisingly easy. Why garments? Last year the Guild hosted a talk about Fibreshed and 1year1outfit – a challenge to make clothing entirely from materials sourced within your local area. I was inspired, but with no non-animal fibre products available in my Fibreshed, and after spinning silk hankies gave me hand pain, I abandoned the idea of being able to participate. But I can buy ethical fibre from further away, and I like the idea of making clothing from fabric I wove. The question of fibre sensitivity hovers over everything I weave or machine knit now. I still have heaps of wool knitting yarn in my stash. Now that I’m weaving fine cotton with confidence, a part of me wonders if all that wool knitting yarn is a waste of stash space. Of course, I can use the wool to make gifts, but to be honest, I don’t have people to weave for and I usually end up giving what I can’t wear to the op shop. A few years ago I realised my stash was becoming more of a weavers stash than a knitters stash. Now maybe it needs to become more of an ethical, non-wool stash. *I’m still not 100% sure about alpaca. Sometimes it’s made me itch, other times not. 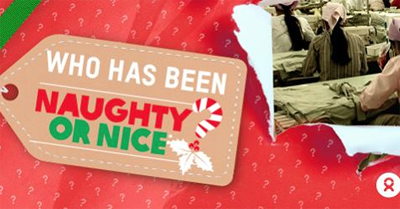 Oxfam have published their Naughty or Nice list, revealing which clothing brands are failing or succeeding at improving their practises and code of conduct, and being transparent with the factories they use. 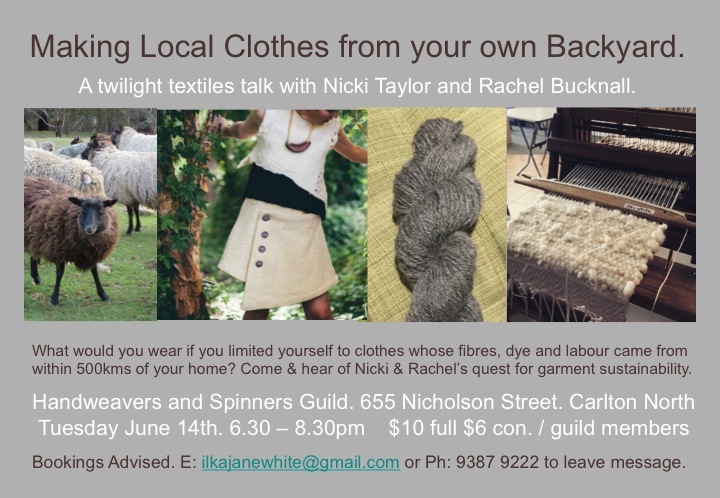 Last night I went to the Victorian Handweavers & Spinners Guild to hear Nicki of This is Moonlight and Rachel of ReduceReuseRecycle talk about Fibreshed and 1year1outfit. One Year One Outfit is a challenge to make a locally sourced outfit in a year. Anyone interested in garment making is welcome to join in. Most participants record their findings through social media and use the tag #1year1outfit to keep in touch with the group. The outfit must be made from natural fibres sourced from your fibreshed, dyed with non-sythetic dyes, and be constructed to last. After seeing the flyer, I investigated the various sites and Facebook pages related to the challenge. It became pretty clear that it would be very difficult for me to participate, because I can’t wear animal fibres against my skin and no silk or plant fibre is being spun in my fibreshed, and I don’t spin. It might be possible if I moved away from fabric. A quick search online brought up a leather tannery using ‘natural’ methods in Melbourne. I could even try basket-making techniques using locally-grown plants. The talk was very interesting and I learned more that what I’d found out in my investigations. I think the most exciting is that there are now ‘mini mills’ where small batches of fibre can be spun. They didn’t say if those mills were spinning silk or plant fibre, but I imagine it requires different machinery. Today my thoughts had shifted to a video I saw recently of Hmong women weaving hemp. I found it again and another that showed how they attach strips of hemp together before spinning it – a method that appeals to me because it does not involve drafting. I got lost in researching plant fibres, and how to make cord and baskets with Australian native plants. It all reminded me how I’d like to make baskets out of materials I’ve grown. And that I need to get those lomandra seedlings in. And how there’s still so much work to do in the garden. Oh – and I nearly forgot: the talk will be repeated on Sunday August 28th, at 2pm. I highly recommend it.